The Giant Banyans of India are the largest known trees in the world, as measured by canopy coverage. One single tree can cover more than 19,000 square meters– almost two hectares! For more detail, you can read the catalogue report, presented below. For interactive maps of the Giant Banyan trees of India, follow the “Giant Banyans” attribute tag from the “About” page or from the sidebar. India is home to banyan trees (Ficus benghalensis) of globally superlative stature. F. benghalensis spreads horizontally by propagating aerial root from its branches which then root, branch, and consequently extend the tree’s crown. Compared to other giant trees known to the author worldwide, these banyans have the largest canopy coverage covered and the broadest crown spread of any known living trees, and by these measures are the largest known trees on Earth. Several of these trees are known to botanists, tourists, pilgrims, and government, but no systematic catalogue or measurements exists. During a 2-year study of notable and landmark Indian trees, several of these individual banyans were encountered. To contribute to the management and appreciation of these trees, a catalogue is presented here with locations, photographic resources, and cultural significances. Using online aerial imagery and measurement tools, the largest known banyan trees of India are quantitatively compared for canopy coverage and crown spread. Using the net canopy coverage area as the primary measure of size, Thimmamma Marrimanu in Andhra Pradesh, at 19 107 m2, is the largest known tree in the world, and one of the superlatively largest living things on Earth. This is approximately nine percent more than the second-ranked tree, the Kabir Vad Banyan of Gujarat, at 17 520 m2. The third- and fourth- ranked trees, with a difference of less than two percent of total area, are the Giant Banyan of Majhi and the famous Great Banyan of Calcutta. India is home to some of the world’s most revered and ancient tree, yet the most physically superlative of these trees have never been compared quantitatively. Banyans, Ficus benghalensis, are flowering trees in the family Moraceae with a distinctive ability to propagate aerial roots: hanging roots that descend from horizontal branches, anchor into the ground, and grow into secondary trunks (Krishen 2006). Over time, a single banyan tree can sprawl across the ground and create a network of interconnected trunks of unparalleled complexity. Many Ficus species are strangling specialists, with the ability to send roots down, and eventually encompass the trunks of other trees after a seed is deposited in the forest canopy. Other species of Ficus– e.g. F. microcarpa, F. citrifolia, and F. macrophylla– can propagate aerial roots, but F. benghalensis reaches the highest levels of extent and complexity (Krishen 2006). These Indian banyans may be the broadest trees in the world, and according to the definitions selected, they may also be the largest trees in the world. Within India, these trees are often destinations for tourists and pilgrims, but are poorly known outside of the country. Several competing claims for the largest banyan that have propagated in botanical, travel, and historical literature are unresolved. To answer this question and assess the Indian banyans in relation to each other and other trees internationally, the largest known banyan trees are catalogued, measured, and compared. Using the aerial photography available on-line via Google Earth software (Version 5.2 , Google Inc. Mountain View, California, USA,URL: http://earth.google.com), these trees are compared in 2-dimensional space for area and maximum extent. A selection of international banyan trees outside of India is presented simultaneously, and finally the metrics and work required by future researchers to directly compare these trees to other superlative giant trees of the world are discussed. Public and scientific interest in the world’s largest trees has brought exceptional individuals into prominence, especially via the tools of photography and internet collaboration. Projects such as regional “Champion tree listings” (Golding and Geldenhuys 2003), artistic data presentation books (Van Pelt, 2001) or tourism phrasing such as “Valley of the Giants” canopy walkway in Western Australia, all directly refer to individual trees of exceptional size. Besides particular individual trees, superlatively sized tree species such as Giant Sequoia (Sequoiadendron giganteum), Karri (Eucalyptus diversicolor), Swamp Gum (Eucalyptus regnans), Sitka spruce (Picea sitchensis), Coastal Redwood (Sequoia sempervirens), and Baobab (Adansonia spp.) are of both scientific and management interest. Worldwide, popular demand for the conservation and interpretation of superlatively large trees is connected to increased eco-tourism. Depending on the definition of “large”, several individual trees contend for these titles. Internet collaboration allows for these contentions to be reported promptly in a non-peer reviewed public forum such as Wikipedia (Wikimedia Foundation, San Francisco, California. URL: http://en.wikipedia.org/wiki/Tree#Record_breaking_trees). By contrast, academic research focuses on the physiological mechanisms of tree growth (Ishii et al. 2008). Furthermore, the numbers are often disputed, and the trees themselves change over time due to weather, age, or human activity. Due to difficulties in measurement of root mass, all of these measurements refer to above-ground structures. The largest known tree, by single trunk wood volume (calculated by adding 3-dimensional volumes of trunks and branches) is the General Sherman, a Sequoiadendron giganteum (Giant Sequoia) in California, USA, at 1,487 m3. The largest single trunk diameter- (circumference at standardized 1.3 meters above ground) is the Glencoe Baobab (Adansonia digitata) of Limpopo, South Africa, with a 15.9 m diameter. The largest known clonal tree- covered by genetically identical individuals – is the Pando Aspen (Populus tremuloides) grove, which covers 43 ha of ground in the mountains of Utah, USA, with 47,000 tree stems. The world’s tallest known tree is a Sequoia sempervirens (redwood) in California, at 115.56 in linear meters above the ground. Other measures that could be studied and compared are the canopy volume, the surface area of all wood and leaves, the crown spread or biomass of roots, the number of leaves, or the mass (not volume) of wood. The Indian banyan trees presented here are likely contenders for the largest geographical area covered by a single tree crown, as measured by square meters covered by a single individual tree. 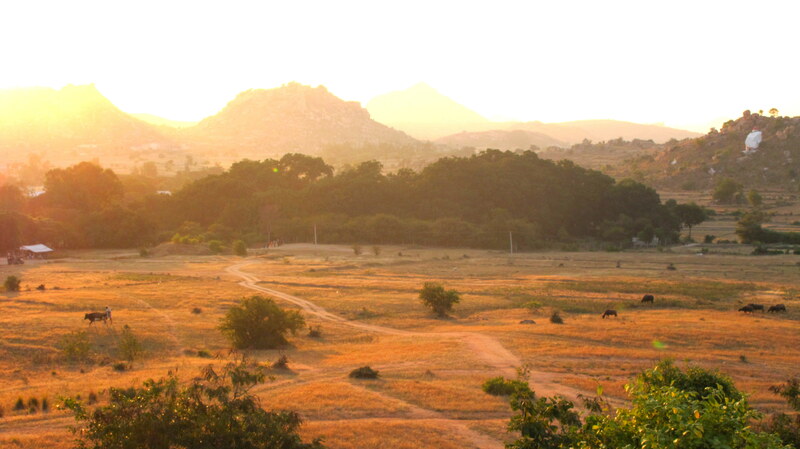 These trees are essential landmarks to the Indian cultural landscape, providing shade, habitat, historical links, and sacred structure to the people of India and other countries. Banyan trees are ubiquitous as central meeting points in towns throughout India. They are sometimes referred to as the Sanskrit “Kalapvriksha”, or mythological wish-fulfilling tree. 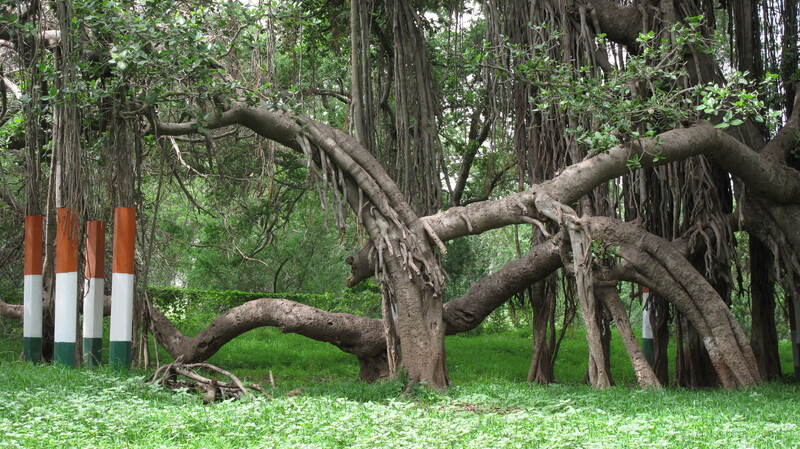 Several banyan trees in India are linked to ancient and mythological events. 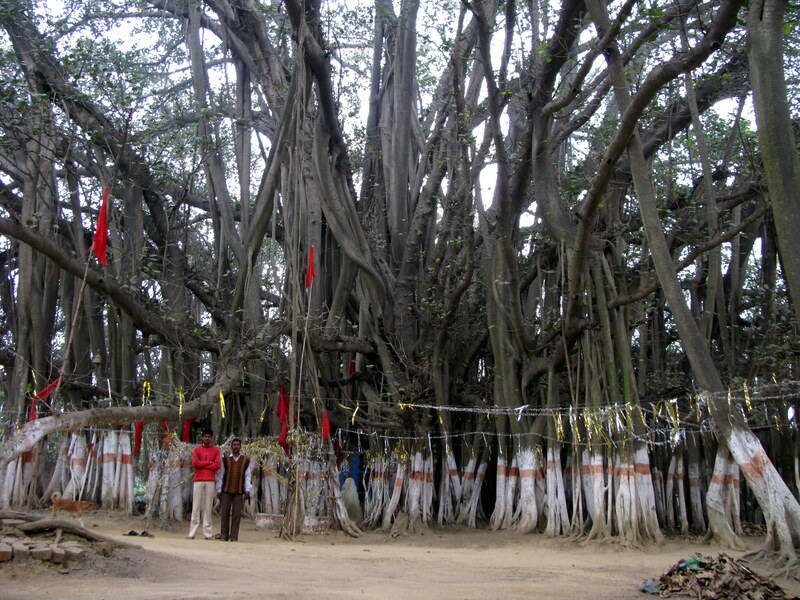 In Kurukshetra, Haryana, a specific banyan is revered as the site of the god Krishna dictated the treatise of the Bhagavad-Gita to the warrior Arjuna of the ancient epic Mahabharata. The sage and poet Kabir, whose writings are sacred to Sikhs, Hindus, and Muslims, is associated with a giant banyan (mentioned below) on an island in the Narmada River of Gujarat. 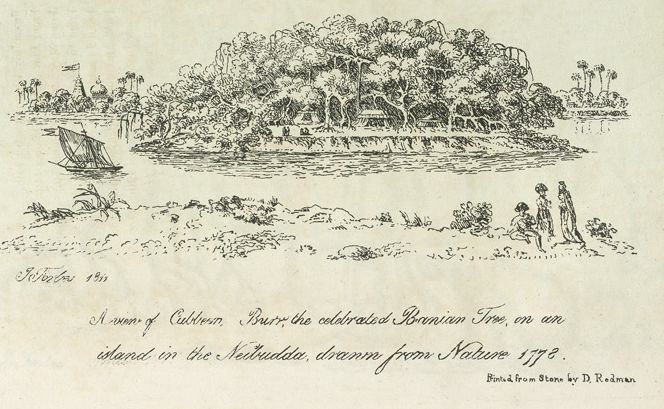 When visited by the British explorer Forbes in 1772, he described it as “’forming a canopy of verdant foliage impenetrable to a tropic sun, extending over a circumference of two thousand feet…” and produced a sketch presented as Figure 1 (Forbes 1812). This tree is claimed to be the same tree visited by Alexander the Great’s army, 2,300 years ago, described by his lieutenant Nearchus as being on the shores of the Narmada River (Burns 1918). As there is no catalogue previously available of the largest banyans, learning about candidates for the largest banyan trees could not be done in a repeatable, systematic matter. This cataloguing of India’s largest banyans was done under the context of a geographical and environmental education project entitled “Landmark Trees of India.” (Bar-Ness 2010) During the years 2008-2010, almost one thousand of India’s most famous, sacred, notable, and remarkable trees were visited, photographed, and mapped (using GPS technology or direct location on Google Earth). This project, and the contacts and publicity associated with it, provided a pathway for information about India’s superlative trees to reach the author. As best as possible, all of the giant banyans were visited. Several of the largest trees are well-known and listed in travel guidebooks (e.g. Rough Guide 2008). Other trees were learned of by newspaper articles, field guide descriptions, or suggestions from botanists and foresters. 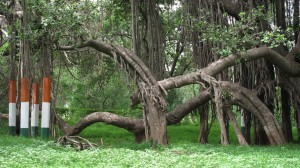 Within India, eight trees were identified as candidates for the largest banyan in India. These trees are commonly claimed to be giants and were learned about as described above. These eight trees are mapped in Figure 2. A further eight banyans within India were selected from the Landmark Trees of India project for comparison; these trees were still remarkably large specimens but were not ever claimed as the largest. This set of trees is presented to show a wider range of large banyans and to add material to this initial catalogue of India’s giant banyan trees. Finally, six banyan trees located in other countries and celebrated as the largest there are presented. These international banyans presented in this article were discovered by repeated internet searches for “(largest OR biggest) AND (banyan OR ficus)”. We did not include either the well-known Akshay-vat Vriksh (Eternal Tree) of Allahabad, Uttar Pradesh, or the Panch Vat (“5 banyans”) of Nashik, Maharsashtra, both known as a resting places of the legendary hero Rama. Despite their fame, these trees were visually assessed as not being candidates. Additionally, we did not include (at this time) the giant banyan at Satara district, Maharashtra, as we were unable to locate it via Google Earth. In total, 22 trees are tabulated here with their locations and cultural significance briefly addressed as Table 1. These trees, to the best of knowledge, represents the first members of a list-in-progress, but should not be considered a complete and final listing. All trees were located geographically using GPS technology or Google Earth software. The latitude and longitude of the 22 trees was tabulated and a collection of geographical placemarks generated. 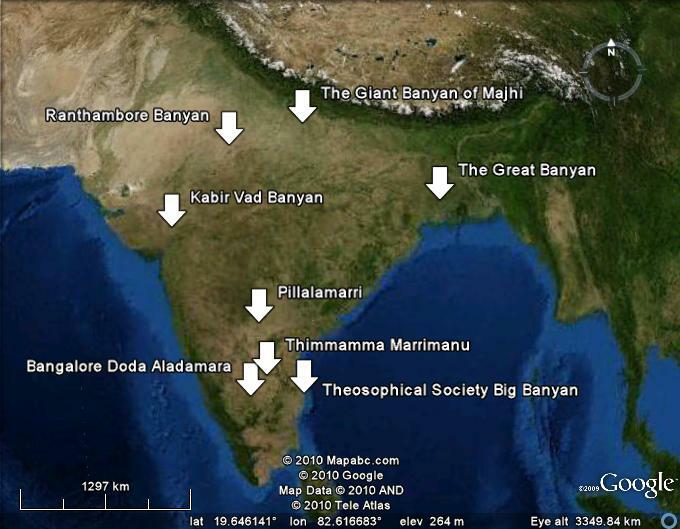 These can be viewed with Google Earth using the data file available at http://www.treeoctopus.net/india/Banyan/Banyan.kmz . Using the polygon function, the outline of the tree’s crown was traced to calculate canopy coverage. The accuracy of the polygons’ representation of the tree itself is subject to the quality of the aerial photography available (e.g. the Phimai Sai Ngam images are of poor quality) and the color and textural contrast with neighboring trees. The provider of the digital imagery and the date of the picture was recorded from the software, and a screen capture taken of the polygon overlaying the tree crown image. These screen captures of the eight candidates for the largest banyan in India are presented as Figure 3. The ruler tool was used to manually measure the crown spread, or the longest distance (on a horizontal axis) from end to end of the tree. The polygons were submitted to the Polygon Calculator at Earthpoint (Earthpoint. Boise, Idaho. URL: http://www.earthpoint.us/Shapes.aspx) and the geometrical statistics- perimeter, area, central point- were tabulated. The original outline was used to calculate the gross area coverage of the tree. For trees with visible clearings caused by human activity, cyclones, or disease, polygons were generated tracing these open spaces, and their area subtracted from the gross area to generate a net area. The trees were ranked by three measures of size: net area, gross area, and crown spread. The data tables presented in this article are the beginning of a catalogue of giant banyan trees. Table 1 provides the location and description for each tree. The quantification of tree size is presented in Table 2, and additional data resources are organized in Table 3. Four trees dominated the listings for the three measures of size: net canopy coverage, gross area, and crown spread (Table 2). The banyan tree covering the largest net area is Thimmamma Marrimanu in the State of Andhra Pradesh (Figure 4). It currently covers a net canopy coverage of 19 107 m2, which is approximately nine percent more than the second-ranked tree, the Kabir Vad Banyan, at 17 520 m2. 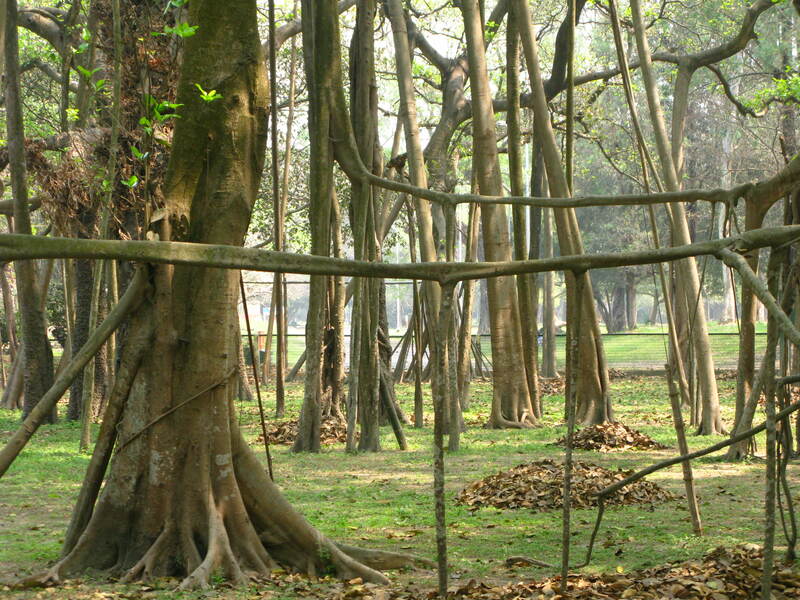 The third- and fourth- ranked trees, with a difference of less than two percent of total area, are the Giant Banyan of Majhi and the famous Great Banyan of Calcutta (Figure 5). When rankings trees with the largest gross area, before subtracting for clearances, these two trees switch places: the Kabir Vad Banyan is the largest at 20 985 m2, and Thimmamma Marrimanu is the second largest at 20 190 m2. 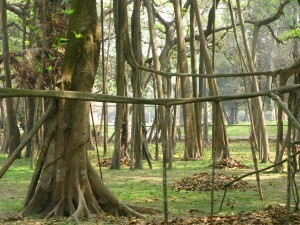 As with the net area, the third and fourth ranks are held by the Giant Banyan of Majhi and the Great Banyan of Calcutta. When looking only at the 1-dimensional crown spread of these trees, the broadest tree was the Giant Banyan of Majhi at 209 m, followed very closely by the Kabir Vad Banyan at 204 m. Thimmamma Marrimanu and the Great Banyan followed in third and fourth rankings. Because a circle is the most efficient container of 2-dimensional area, the change in rankings is related with the change in eccentricity of the circular shape, i.e. the two trees with the largest crown spread are less circular than the other two trees which have larger area. Using the net canopy coverage area covered by a tree as the primary measure of size, Thimmamma Marrimanu , at 19 107 m2 is the largest known tree in the world. A prominent sign claims that the tree covers 2.5 ha in area, but our measured value of 20 190 m2 gross area is substantially smaller than this claim. Substantial damage to the tree was caused by a cyclone, but the primary damage to the tree has been human-caused clearance. 1 082 m2, or five percent of its gross area, has been completely cleared. This tree is known as the largest banyan to botanists and tree-enthusiasts of India, but it is generally unknown to the public. The Kabir Vad Banyan, even with sixteen percent of its 20 985 m2 gross area having cleared for the temple inside, is still the second largest tree in the world as measured by net area. While this tree is well-known as a pilgrimage destination, few claims for its superlative status are extant. 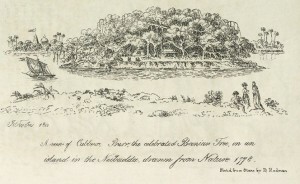 Forbes (1812) reports that the tree was both heavily flood-damaged but still was “2000 feet” in circumference, or 29, 254 m2 area with 194 m diameter. This historical value, if true, would be half again as large again as it is currently. Without the clearance to the tree caused by the temple’s construction, this tree would cover the largest gross area of any single known living tree. This tree is of additional interest, as the possibility it is more than two thousand years old would make it one of the oldest known banyan trees. Hidden in the mango orchards near Lucknow, the Giant Banyan of Majhi was the largest measured tree for crown spread. It is almost completely unknown outside of the region. There were no references to it encountered by the author, save for one newspaper article (Shukla 2008). This tree, growing next to well-tended mango orchards, was the most difficult to delineate on the aerial imagery. The tree most often claimed as the broadest banyan in the world, the Great Banyan of Calcutta, was the fourth-ranked in our three measures of size. The Great Banyan of Calcutta is signposted as being 1.5 ha in area, and our value of 16,531 m2 for net value is comparable to this value. However, our results do not support the often-claimed contention that this is the broadest tree living. Pillalamarri, near Hyderabad, is a giant banyan that has the fifth largest net area (12,267 m2) and the fifth largest crown spread (154 m). The popular tourist destination near Bangalore, the Doda Aladamara, is the sixth largest tree by net area (10,305 m2) and the sixth largest by crown spread (139m2). Like other superlative banyans, this one has had three percent of its gross area removed for construction of a temple. The Theosophical Society Banyan in Chennai is also often claimed to one of the largest trees in the world, and is most commonly referred to as the second largest after the Great Banyan. However, its signposted area coverage of 59,500 feet2, or 5,527 m2 is only about a quarter of the gross area of the Kabir Vad Banyan. For all three measures of tree size, it ranked seventh. The Ranthambore banyan, at the Jogi Mahal at Ranthambore National Park, is the eighth largest banyan for the three measures of tree size. Of the trees outside of India, the one with the largest net area covered is the Lahaina Banyan in Hawaii, covering 4,225 m2. This is about one-fifth the area of the largest Indian trees. Figure 6: Interior view of the Giant Banyan of Majhi, Uttar Pradesh, India, Note red prayer flags and white-painted lower section. In this article, techniques developed only in the last several years are used to quantify these claims. Our contribution is to establish a catalogue for future students of giant Ficus trees, governmental and local custodians, superlative-interested botanists, and the public tourist to access organized information about these trees. Compared to other giant trees known to the author worldwide, these banyans have by far the largest canopy coverage covered and the broadest crown spread of any known living trees. While this report is intended to compare the claims of superlative size between Indian F. benghalensis, it additionally provides quantifiable information on the exceptional size of these trees relative to other species. In the absence of any known contentions that other tree species have larger area of canopy coverage, these trees are presumably amongst the most physically superlative living organisms on Earth. Consequently, these trees are the largest trees known on Earth to those who hold canopy coverage or crown spread to be the critical measure of tree size. Beyond the aerial photography 2-dimensional analysis used here, future site visits could incorporate more detailed measurements using such tools as laser scanners, stereo photography, or direct tape measurements of all branches. These detailed measurements could assess whether these trees are also the largest living trees by wood volume. By adding up the wood volumes of each of the thousands of trunks and interconnected branches present in the larger banyan trees, a total value could be directly compared with the 1,487 m3 of wood volume in the General Sherman Sequoia in California. Figure 7: Interior view of the Kabir Vad Banyan, Gujarat, India. Note the metal frames guiding aerial roots painted to colours of Indian flag. The cataloguing and measurements of these trees is by no means a final, static statement on these superlative individuals. Not only will these trees grow and shrink over time, but the techniques and available imagery at the time of analysis are subject to change and debate. The trees will be altered by fungal and insect attacks, inclement weather, geological events, and human impact. It is conceivable that the clearing of area cut from a banyan tree for religious or interpretive building may actually contribute to its longevity and health: the increased care due to the attention and reverence associated with these modifications may outweigh the damage to the living organism. The readers of this article are encouraged to share and publicly compare any contending claims for the world’s broadest tree, and to visit and study these individual trees. Unlike many other superlative trees which exist in wilderness areas susceptible to visitor impact, these banyan trees are all oft-visited and already affected by human activities. Internet tools, and correspondence with interested organizations or individuals, will aid all in accurate measurements and useful application of the data. It is hoped that these organisms will survive, like the Kabir Vad Banyan, for at least another two thousand years and provide inspiration and shade for generations to come. The author would like to acknowledge the support of the United States and Indian Governments via a US-India Fulbright Scholarship. The author was hosted by The Energy and Resources Institute, Delhi. Inspiration and assistance were provided by many, including: R. Van Pelt, G. Parker, N. Nadkarni, S. Sillett, W. Hermann, A. Larson, J. Franklin, J. Romanski, B. Mifsud, H. Gupta, W. Adriaanse, J. Miller, R. Kumar, P. Krishen, T. Geisel, and S. Sanghani. This article is dedicated to the memory of arborist S. Sharpe of Launceston, Tasmania. Ishii, H.T., Jennings, G.M., Sillett, S.C. & Koch, G.W. 2008. Hydrostatic constraints on morphological exploitation of light in tall Sequoia sempervirens trees. Oecologia 156: 751-763. Krishen, P. 2006. Trees of Delhi. Dorling Kindersley, Delhi. 360 pp. Rough Guides. 2008. A Rough Guide to India, 7th ed. Rough Guides, London. 1200 pp. Shukla, N. 2008. UP has its own mammoth banyan. Times of India (Delhi edition). 2 July 2008. Van Pelt, R. 2001. Forest Giants of the Pacific Coast, 1st ed. University of Washington Press, Seattle. 200 pp.